You are currently browsing the tag archive for the ‘Little Red Riding Hood’ tag. The Reception Corridor murals at Fulbridge Academy, one wall based upon the book ‘Dear Zoo’ by Rod Campbell and the other The Gruffalo, The Gingerbread Man and Little Red Riding Hood. A continuation of the Reception Corridor project at Fulbridge Academy where earlier this summer I painted a mural based upon the book ‘Dear Zoo’ by Rod Campbell. The painting would illustrate 3 stories within the same composition which the children would be using as reading books – The Gruffalo, The Gingerbread Man and Little Red Riding Hood. An additional element was to be incorporated too, a cottage, which was built and installed by Brian Branch. The composition for this mural would therefore have a definite division, with this structure affording me the opportunity to develop two distinct and different sections. I decided that the first would be light, but that the next could have a much darker and sinister atmosphere. 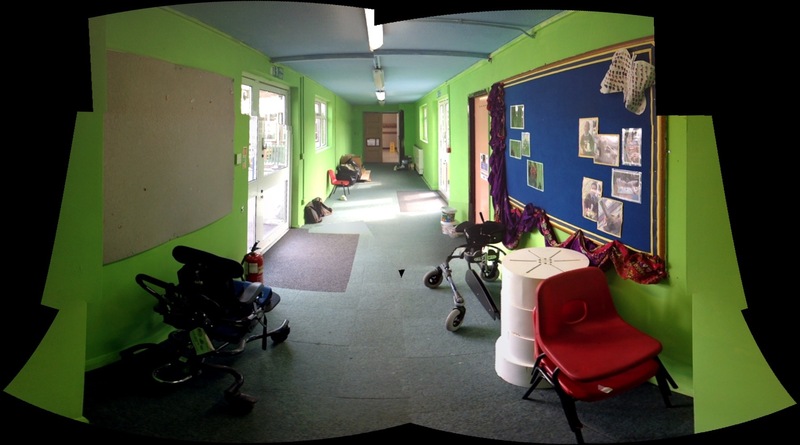 Although located in the Reception area of the school the corridor also leads to the Dining Hall which becomes busy with children from all year groups at lunchtimes. My drawings for the composition, therefore, were influenced by the route taken by the children and developed by being read from left to right. However, the composition also needed to take into account their return route so that a storyline could still be identified when passed in the opposite direction. The small mouse from the Gruffalo book begins the story by walking into the composition, with an unseen fox (which also has a part to play in the second story) positioned around a corner. 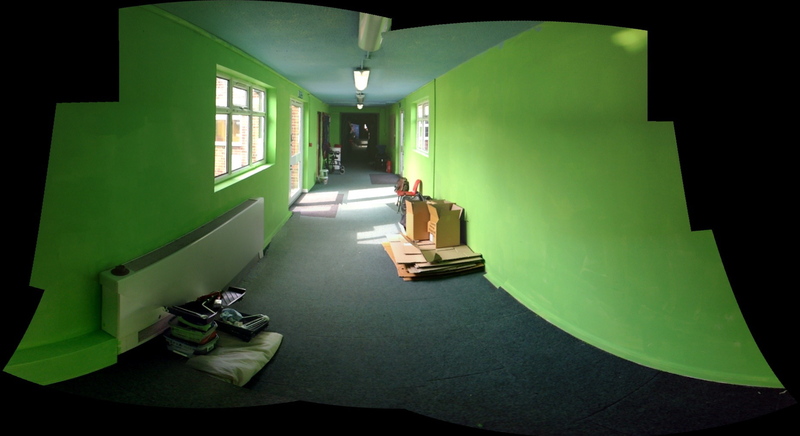 A very large Gruffalo appears next, painted almost to the full height of the corridor wall, taller perhaps than all the teachers in the school. A wide door creates a break in the painting but the composition is connected by a footpath which weaves through the mural. Then a snake emerges from a woodpile to examine some mysterious and very large footprints, while an owl hovers overhead. In the background there is a river, which not only appears in the Gruffalo book but is also an important ingredient for the next character in the painting. A larger than life Gingerbread Man runs, runs as fast as he can towards it, along a path which continues behind the cottage from which he has just escaped.